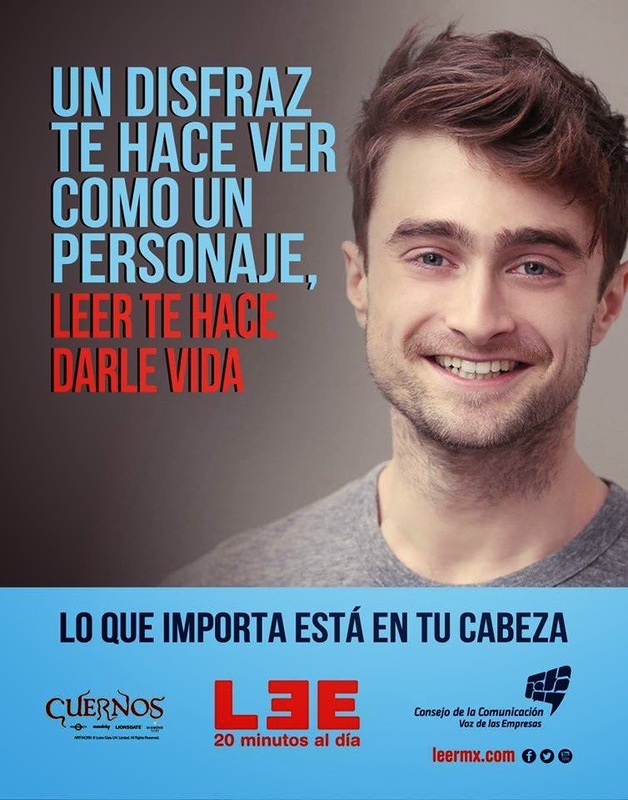 Below you find a poster featuring Daniel Radcliffe from the Mexican reading campaign set up by the Communication Councel in Mexico with the tagline "What matters is in your head" ("Lo que importa esta en tu cabeza"). This part of the campaign runs from October 2014 to March 2015. Others who participate are Olympic medalist Paola Espinosa, Players Pittsburgh Steelers Troy Polamalu and Brett Keisel, Ines Sainz drivers and Mauricio Mancera. As licenses: Star Wars and SpongeBob. Horns (Cuernos) is also mentioned on the poster. 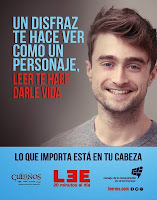 The film will be released in Mexico on 18th December. Update: 12th December 2014. 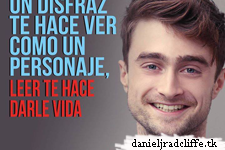 Daniel's quote below. Update: 16th January 2015. A behind the scenes photo. Update: 27th June 2017. Full photo shared by Paco Díaz on Facebook. This new campaign aims to make reading an inspiring, moving participatory and involving all; where young people are the influencer entity that transforms our society making way for knowledge and recreation, becoming a role model for adults and for future generations. The guiding principle of the campaign is to communicate to young people beyond their appearance, what really matters is what is in your head. In this sense, reading is the tool that makes what's inside of them is better and stronger, because through it can express, create, engage and build their own personality. Likewise, the campaign applauds individuality, respects the identity, dress and think, encouraging freedom of expression among young people. Mexico is the second largest number of young people, therefore this reading phase, the Communication Council is convinced that the effect of this campaign will help to multiply efforts to make Mexico a country of readers, understanding that reading is the tool for raising educational standards in our country. More info: leermx.com. Facebook / Twitter.